LONDON, Mar 21, 2019 - (ACN Newswire) - WARC, the international marketing intelligence service, has found that of the $590.4 billion spent on advertising worldwide last year, $144.6 billion (24.5%) went to the Google and Facebook 'Duopoly', which equates to almost one in four dollars. The duopoly's adspend share is up from 20.3% in 2017 and is more than double the 10.8% recorded in 2014. WARC predicts a further increase to 28.6% ($176.4 billion) this year. 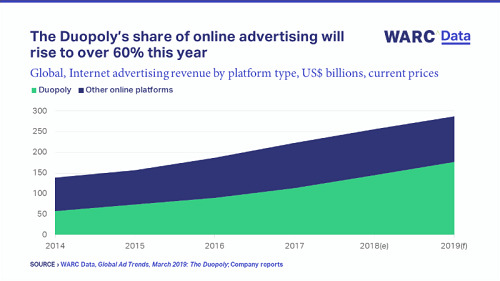 Looking only at the internet advertising market, the duopoly took over half (56.4%) of ad money in 2018, a share which WARC expects to rise to 61.4% this year. This growth is squeezing other online media owners, as the pool of ad money available to them is now in decline for the first time, down 0.7% to $111.0 billion. Whilst WARC expects Amazon to make $13.9 billion from advertising this year (compared to Google's $107.4 billion), its ad business is growing much faster than Google's, with 69% of marketers in a recent WARC survey stating that they intend to up their ad investment on Amazon this year. Download the report sample from content.warc.com/read-the-warc-data-global-ad-trends-excerpt-on-the-google/facebook-duopoly. Global Ad Trends, a monthly report which draws on WARC's dataset of advertising and media intelligence to take a holistic view on current industry developments, is part of WARC Data (www.warc.com/data), a dedicated online service featuring current advertising benchmarks, data points and trends in media investment and usage.